In the wake of the massive 8.9-magnitude earthquake and tsunami that hit Japan earlier today, the government has issued an evacuation order to thousands of residents near Fukushima No. 1 power plant in Onahama city, about 170 miles northeast of Tokyo, after its primary and emergency cooling systems failed (there are six nuclear units located at this facility run by Tohoku Electric Power Company’s (TEPCO) which is the Japanese power company that has expressed interest in investing in NRG’s expansion at South Texas (nuclear) Project). Japan’s nuclear safety agency said workers are currently scrambling to restore cooling water supply at the facility, but that there was no prospect for an immediate success. So far there have been no reports of any radiation leaks. UPDATE: At 4:30 CT on Friday, March 11th all the U.S. news outlets were breaking news about radiation levels in the control room of the No. 1 reactor of the Fukushima nuclear power plant reaching around 1,000 times the normal level and that some radiation has also seeped outside the plant, prompting calls for further evacuations of the area. The quake struck just under 250 miles northeast of Tokyo, the U.S. Geological Survey said. 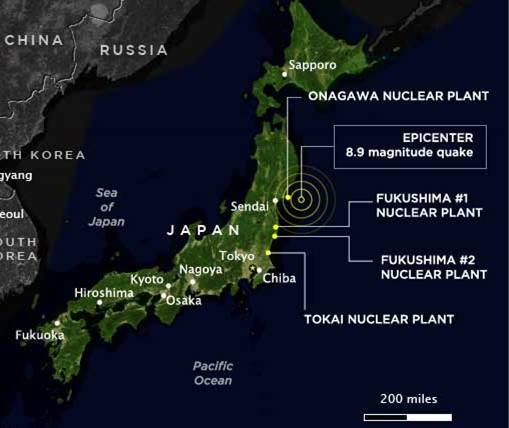 It was followed by more than a dozen aftershocks, one as strong as 7.1, and eleven nuclear reactors were automatically shut down in the affected area, according to the Japanese government, but they haven’t confirmed any effects induced by radioactive materials outside the facilities. In addition to the situation at the Fukushima plant, at the TEPCO’s nearby Onagawa facility, which is in the worst-hit Miyagi prefecture north of the Fukushima facility, a fire broke out at the plant following the quake. The blaze occurred in a turbine building, which is separate from the plant’s reactor, and was reported as being quickly extinguished. However, there seems to be some concerns about the cooling system at this plant too and the the Japanese government has also declared a state of emergency at this facility. Another unit at Onagawa is reported as experiencing a water leak, though it is unclear whether the incident is significant. Obviously, we don’t know if any of these reports will lead to a serious nuclear event or not, but the isolated reports so far are worrisome. In this region, earthquakes are a design basis accident which nuclear plants are supposed to survive, but engineering, while it can take many factors into consideration and build in multiple backups, can only be tested by an actual natural disaster. The problem is, under such circumstances, if there is a failure, one can only assume that other systems (transportation, power availability, access to experts and technicians – all the ancillary things ones needs to deal with a containing a serious event) will also be disrupted. So when a nuclear “expert” tell you that a plant is designed to withstand a massive hurricane, storm surge, tornado, or earthquake, keep that in mind.